When it comes to topnotch renegade motorcycle gang films, it seems like only the world of independent film has contributed notable works to the highly neglected leather-bound genre. Sure, Hollywood gave us the iconic biker gang flick The Wild One starring Marlon Brando, but unfortunately the film has aged in a less than a graceful manner. With his masterwork of risqué biker art Scorpio Rising, Crowleyite auteur Kenneth Anger gave us a film that exposes the most esoteric of desires, which only an artistic individual with an instinctive knack for psychoanalysis could have visually dreamed up. 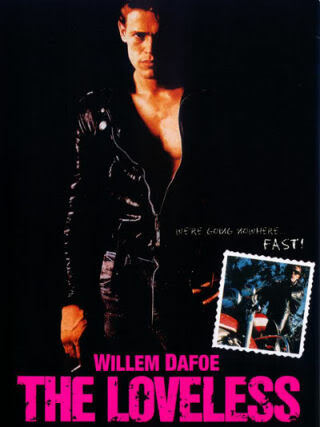 For their dark and gritty biker film The Loveless (1982), co-directors Kathryn Bigelow and Monty Montgomery re-invented The Wild One in a most culturally subversive manner, thus creating what I have come to believe is the definitive motorcycle gang film. After having seen Bigelow's subsequent psycho-sexual vampire film Near Dark (1987) many times in my life, I can say with the utmost certainly that the female filmmaker's fetishistic auteur signatures also vividly resonate in her first feature-length picture The Loveless. Although Bigelow's directorial stamp is obvious in The Loveless, co-director Monty Montgomery's contribution to the film must also be noted. After watching The Loveless, it will be no surprise to the viewer when realizing that Montgomery was also responsible for co-producing David Lynch's TV series Twin Peaks, Hotel Room (TV Miniseries) and Wild at Heart. Like the surly Americana works of David Lynch, The Loveless is a picturesque joyride through a cryptic-subculture left virtually forgotten by Hollywood filmmakers. Although Willem Dafoe is certainly no Marlon Brando, he does a wonderful job portraying the main protagonist Vance in The Loveless. Despite being a novice actor while acting in the film, Dafoe radiates such a high potency of suaveness that it becomes totally believable when he effortlessly manhandles every lady that passes his predatory gaze in The Loveless. During the beginning of the film, Vance nonchalantly gropes an older woman he calls "Mom." 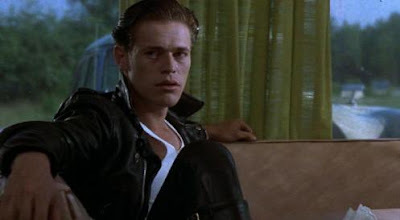 Vance, a young man that makes no lie of the fact that he disdains work, more resembles Marlon Brando's character Valentine from The Fugitive Kind (1959) than Johnny from The Wild One. And just like the anti-heroes from The Fugitive Kind and The Wild One, Vance comes under attack from a group of townie rednecks that don't take kindly to strangers who wear stylin' jackets. In a manner comparable to David Lynch's Wild at Heart, the reverb-laced soundtrack of The Loveless - which includes a complimentary mix of blues, rock, and rockabilly tunes - accentuates the overall wildly audacious aesthetic of the film. Robert Gordon, who is a rockabilly musicians in real-life, plays the vehement biker Davis in the film. Unsurprisingly, Gordon also composed most of the music for The Loveless. Eddy Dixon, who composed the anthem "Relentless" for The Loveless, would also go on to play the character Rex in David Lynch's Wild at Heart. 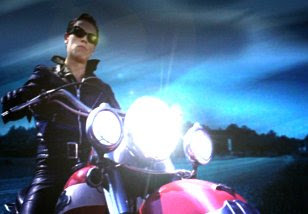 As someone who has always had an affinity rebel greasers and rockabilly/psychobilly music, I regard The Loveless as a motorcycle gang masterpiece worthy of the leatherjacket sporting gods of rockabilly heaven. I am not exaggerating when I say that The Loveless concludes in a manner comparable to a holocaust of bikers. Like most decent films, The Loveless guides the viewer into an unrelenting climax that will stay with you until your life ends. I credit Kathryn Bigelow's female touch as giving The Loveless the distinct sensuality and wild sexuality the film so naturally reverberates upon the viewer. The Loveless is no small effort when you consider that it was originally created as Bigelow's film school thesis. It will be apparent to the viewer that Ms. Bigelow fell in love (as you will too) with characters that she created for The Loveless. This seems especially true for the character of Elena; Vance's tragic love interest. Unlike Brando's love interest in The Wild One, Elena is a multifaceted lady, whose life of misfortune finally erupts at the conclusion of The Loveless in a way that will shock even the most desensitized of film fanatics. Before watching The Loveless, I always wondered how much of Kathryn Bigelow's auteur signature was discernible in her films. After watching the film, I know that Bigelow has been using many of the same themes throughout (from The Loveless to The Hurt Locker) her notable directing career. 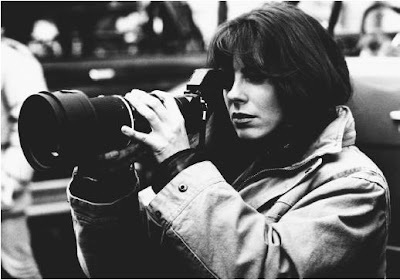 I can say with sheer sincerity that Kathryn Bigelow is now one of my favorite female film directors, only second to Leni Riefenstahl. If you fancy aesthetically pleasing nihilistic rebellion, you will certainly love The Loveless. It would be good to read your opinion on "Hells Angels On Wheels" (1967) although admittedly its no-where near as hard-nosed as "The Loveless" (because it was made 15 years earlier when that idiotic Hayes office "so-called" code of conduct was still unfortunately in place) but its still good for quite a few laughs. By the way, wheres that reveiw of "Anguish" ?. Another one for me to see! I love hearing about a director who made evident that they cared about the film they were actually making. Too often I see films that work harder on the hype of the film rather than the film itself. Besides if Bigelow did "The Hurt Locker" I have to give it a try. That film was awesome! YOU HAVE A BULLDOG TOO!! Yay! I love it. Hank, that's a cute name. I love all dogs but a bulldog is a whole different kind of love. I wish I could get another one! I'm glad you noticed his bow tie. haha! His rolls tend to swallow it. : ) Sushi thanks you for the B-Day wishes! The Loveless is one of those haunting moves that starts out as a retro motorcycle flick and leaves you as haunted as Bagdad Cafe It is stark, cold, and chilling at points. Interesting that Kathryn Bigelow and Willam Defoe really did their first notable work here. This film has a strange reality to it....give it at least 30 min before you decide to ditch.